- Unique design , good quality and easy installation. - Standard color temperature : 5500K color temperature make photo color standard. - Easy shooting : Press switch comes steady soft built-in illuminant, no need to adjust lighting, portable with highly bright shooting effect. 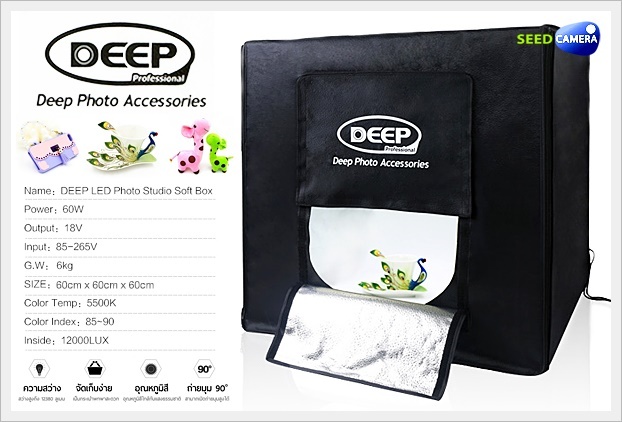 - Easy to maintain : Delicate Acrylic plates and Acrylic white background paper; wipe dust with wet cloth or ethyl alcohol. - Durable : Acrylic material with smooth pure white background, durable for years, no worry about any scratch, deformation or fade, 8000 hours lamp life. - Amazing shooting effect : High density white soft light without shade, easy to match with any background paper and camera (adjust with proper lighting exposure). - Perfect for items like Jewelry , toys , electronics , cosmetics and so on (items no more than 65% shooting space).